You make a po boy and I’ll eat it. You make a messy, dripping po boy and I’ll devour it. The messier, the better. It has to drip and run all over the place. That way I can dip my bread in the juices. Perfect. Like this slow cooker beef debris po boy. ‘Debris’ refers to beef that is cooked and then cut into shreds. In this case, we cut the beef first then cook it until it completely falls apart. The sauce is absolutely incredible. You’ll want to just take a spoonful of it and eat it right out of the slow cooker. The aroma of the beef cooking in the delicious sauce will drive you crazy all day long. You will find yourself doing like I did, trying to rush the clock forward to dinnertime. Fortunately this recipe for a slow cooker beef debris po boy makes a big batch so you’ll have plenty of it on hand to enjoy again and again. I love sandwiches topped with tender slow-cooked beef. Try my spicy Italian, French dip and New Orleans roast beef sandwiches too. Place 4 tablespoons of the flour into a large bowl. Season with salt and pepper. Working in batches, coat the meat in the flour mixture. Shake off excess then transfer to the hot oil and brown on all sides. Transfer to a slow cooker set to low. De-glaze the skillet with wine, scraping all of the goodies off the bottom of the pan. Reduce heat to medium and add the onion and celery. Cook 10 minutes or until starting to soften. Add the remaining 2 tablespoons of flour and stir well. Slowly stir in 1 cup of the beef broth. Add the Kitchen Bouquet and onion and garlic powders, stir. Add the dried pepper flakes, if using, and stir. Pour mixture into the slow cooker and stir. Cook 8 hours or until the beef is fall-apart tender. Slather the loaves with mayonnaise and add the lettuce, tomato and pickles. Spoon in the meat mixture and devour. 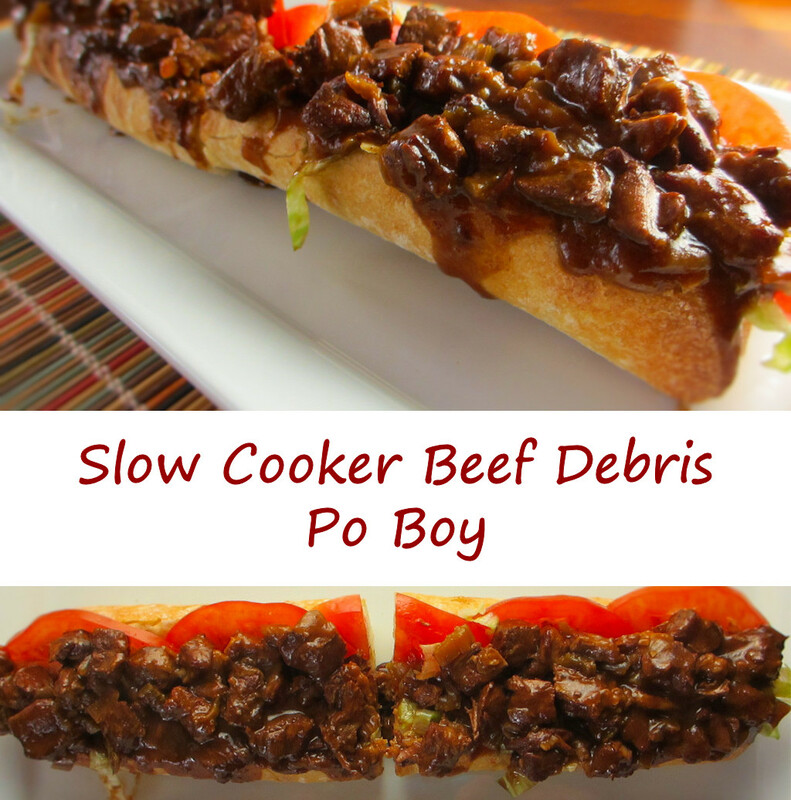 This entry was posted in From the Slow Cooker and tagged beef, debris, po boy, recipe, sandwich, Slow Cooker Beef Debris Po Boy by Mike. Bookmark the permalink.